Energy Conversion: Lash can convert energy from various sources and subsequently emit it from his palms. His powers are capable of disintegrating a living being. Energy Absorption: Lash can draw the necessary force needed to convert said energy into another energy form for him to use. Energy Manipulation: Lash has shown he can control whatever energy he happens to have on hand at the time for a variety of effects beyond just disintegration blasts. Energy Shield: Lash is able to form protective energy shields. Teleportation: Lash seems to have an undefined ability to teleport form place to place either through the city of Orollan or by himself. 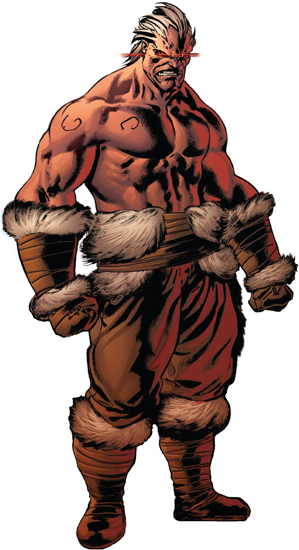 Born in the hidden Inhuman city of Orollan, Greenland, Lash was one of the few chosen among his generation to receive the gift of Terrigenesis, an honour he believed not every member of his race was due. When King Black Bolt activated a Terrigen Bomb above New York City, flooding Earth's atmosphere with Terrigen Mist and awakening the powers of latent Inhuman descendants unknowingly living among humanity, Lash embarked on a crusade to find all the individuals affected, and judge for himself whether they were worthy to live with their new abilities.